Song "Nobody Hurt No One"
- Were you thinking about the win when you submitted application? - Application was submitted by my producers, and I learned that I will take part in the Russian preselection process only when my name appeared in the lists of semifinalists. - Whom did you consider to be your main rival in the contest? - All were rivals as it is competition. But most of all I liked songs of Dima Bilan and duet of Sasha Panaiotov and Aleksei Chumakov. - What was most important for the win? - I just needed to be sure in myself. Now I have such a team that can ensure me. And the song is already quite known for me. - Are you going to Kiev for a win, or for a simple participation? - There is just a few time left till May. We all have a lot of work to do, I'm expected to make European promo-tour. I'm ready for everything and don't afraid to get tired. And to Kiev I go for a good result. - Well, I won't say that it is anti-american. But generally I agree with its lyrics. Enough of violence and terror. Stop hurting each other - this is the meaning of the title. - How much are you going to change your performance before "Eurovision" contest? - It will change, but we were not thinking about it yet. Now we have a lot of work to do - we already discussed with my producers Iosif Prigozhin and Victor Drobysh that we need to record song as soon as possible and start promo-tour. In the middle of the March first studio record of Natalia Podolskaya's entry is completed. While recording internet sites are been flooded with pseudo versions of the contest entry, as possible studio records are presented old demos which has nothing to do with Natalia at all or polished live recordings. All this anti campaigne is being organized and supported by young Russian fans of one of female singer, who completely failed during national preselection as she was at all unable to perform live. The only official studio version of the song is being recorded in Finland by Finvox studion, mastering of Music Makers. It was announced at the beginning that management of HIM and Rasmus bands have participated in this recording, and only just before the start of the contest real names of musiciants appear - Okko Laru (drums and bass) and Varre Vartiainen (guitars) - regular musiciants of Finvox studio, which has nothing to do with named bands. Since March 18th radioversion of the contest song is being rotated on Russian radiostations, the only difference from the main version is 10 seconds extra guitar solo. Later dance remixes for the contest entry also enter rotation. The same days it was decided that during the meeting of the heads of delegations in Kiev as videopreview will be presented semifinal performance of the entry (with prerecorded backing vocals) and the possible shooting of the video was delayed. Official release of the single was also delayed, but specially for the contest promo CD and DVD were prepared. Then... after all plans we've got month of complete silence. Nothing is happening, no information is given. Our site decides to publish highly critical appeal to the management of the singer, where we pointed out that broadcaster Channel One in fact does nothing to promote it's entry, no preview clip was filmed, no news on expected promo tour appeared either. Even no promo singles were posted to the European mass media and details of future contest performance were not yet discussed. At the same time different pseudo fan sites keep on publishing false information, fake interviews and more fake song versions which sometimes are originated by the sourses which claim their fake status of Channel One representative. Nor Channel One itself, nor management of the singer do nothing to decline this rumours and complete lies, putting a wall between them and mass media. The popularity of the song goes down day by day and in fans polls it drops to the third dozen. The end of April is the latest time in history of Russian participations when shooting of the video is been completed. For what audience it is made? As we already claimed the priority of Western promotion, it is difficult to hope that video made just one month before the start of the contest can be broadcasted anywhere exept in Russia itself. So it happened - the video was seen only by rare internet fans of the contest and singer herself. The other step, author of which is still unknown, not only completely failed but started big interntaional scandal in the field of rock music. With the assistance of patheticly launched official website of Natalia (despite existence of highly informative and competent fan club and site of singer) it was advertised that in the video for the song highly respected Finnish musicians - Aki Hakala (Rasmus) and Timo Huhtala (Killer) will participate, and that they will also join the band of Podolskaya in Kiev. It was said that besides them the band will be made of Olga Belaya and (is it another mistake, or another attempt to draw attention?) winner of Stars Factory show Victoria Daineko. Our site immediately completed extensive research and despite the claims of "experts" from Dutch site esctoday, OGAE Russia club, or dni.ru news resource, who continued confirming participation of Rasmus' drummer in the video even after seing it, announced the real thing. Ex-Killer drummer and at the moment drummer of unsigned band Cabin Crew Teijo Jamsa and his bandmate Timo Huhtala have appeared in video. 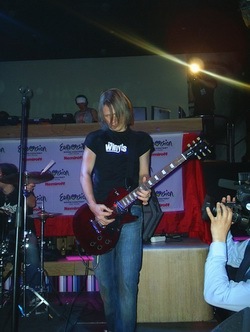 But (and there are two versions to explain that - either Timo was busy with his school studies, or disliked participation in the pop contest) bass player was replaced before the live performance and other Finnish musician Toni Hintikka from Technicolour band appeared in Kiev. As we expected no Victoria Daineko from Stars Factory also appeared there, and the remaining spot of backing vocalist was taken by Yana Kozlova, also known as Yana Daineko, sister of different Victoria Daineko and daughter of famous Belarus singer Valery Daineko, also known as soloist of Poyuschie Vmeste band. Of course, such a "wrong" information published by official sources just arised anger from the fans of world famous Rasmus band, which resulted in multiply protests at the forum of new Podolskaya website, and lead to its "temporary closing", which lasted till the end of the contest. We need also to mention that the video itself was rather professional, but other factors completely drew attention out of it. It was filmed on 18th of April at Helsinki Tavastia night club, at the rock stage, where as main figures appeared Natalia, her band - guitarist, bass player and drummer. Another hero of the song - "Erica girl" with her gun also made appearance in video. Those who answered advertisement of Sputnik Radio have appeared in the video as listeners in the club. Director of the video was Igor Burloff. After video preparations of Natalia's style for the contest has started. Natalia Pilat was chosen as main stylist. There were quite a lot of different variants suggested, as Victor Drobysh comments: "Right after our win at the national Russian preselection a group of choreographers told me that all of them are ready to turn our song to the brilliant show performance. My god, but this is rock song, and it can only be performed in usual traditional rock style! " - I suggested to Natalia's producer Victor Drobysh to mix something light and airy with something rough and to dress Natalia in a military uniform coloured with flowers and to enter the stage on anti-tank gun, but Drobysh only asked me if I really turned crazy. Later this style was implemented in the debut of new band R@mashki at the National Music contest "5 stars". Interestingly, next year, after Lordi success, Drobysh raised own version: "I had idea that Natasha should enter the stage with dishevelled dirty hair, and the stage presentation should also feature small girl with a doll, which will tear out doll's head at the end, get gun and shoot Natasha, but everyone was saying that I am crazy. And I had to agreed with them, and I'm very displeased now that I missed that opportunity"
After looking on other suggested variants, some of which suggested to involve Natalia's twin sister in the show, it was finally decided that style should be similar to the style of Garbage band, which fit the song and the performer quite well. Natalia Podolskaya: "My dress was invented by my stylist Natalia Pilat. I know her pretty well, as we already worked together during "Stars Factory" show. She works with different stars, like "Blestyaschie", creates image for Also, and I fully rely on her taste." First it was intended to include some pirotechnical stage effects into the performance, but organizers prohibited to all countries usage of pirotechnics on stage. The official single was also issued (see all details in a special section below). According to the official information it went on sale one month before the contest and even "led Russia sale charts"! However really it went on sale only after the contest and before the event it's promo copies were handled to the journalists covering events from Kiev. At radiocharts Natalia's song managed only to enter top 50 one week before the Eurovision final. For the first time Russian participant was officially sent on promotion tour by Drobysh's center and Channel One. But fans of the contest are still wondering what is better - to have promo tour like this or not to have any at all? On the tour Natalia performs solo, without supporting band, miming to the recorded track. In Russia similar performance was shown at Radio Day on 19th of April. First stop of tour was Ukraine, where Natalia took part in festival "Tavric games". Invitation to this festival was sent to all participants of Eurovision, but in the result, besides Natalia only Ukrainian GreenJolly, British Javine, Israeli Shiri Maymon and Croatian Boris Novkovich stepped on Ukrainian soil. Performing in such a wide company and taking into consideration that festival was not broadcasted live on Ukrainian national TV, it was rather difficult to raise attention from the viewers to the Russian entry. Mass-media representatives appeared to be more interested with the scandals that followed Natalia's trip to Ukraine, reporting that her managers didn't book the plane tickets in time and Natalia had to go on Yak-40 plane belonging to football club Dinamo Kiev. After such a "comfortable" trip Natalia's first international performance of the song remained un-noticed. Besides participation in the festival Natalia has took part in 5 radio shows, including show of ESC 2005 host DJ Pasha, and 3 tV shows, including interview to Inter TV company, however her name remained strang to Ukrainian public and often local journalists were asking a question: "Is it true that Podolskaya is sister of Kirkorov?" Second stop of Natalia's tour was Croatia. She took part in a special ESC related show "Studio 10" where Croatian TV managed to unite 14 of the contestants of ESC 2005. Another big company where Natalia's performance was hardly noticed, especially as it had no stage effects. Natalia has not given any single interview in Croatia. In Belgium all program was made of single performance at the night gay club Popi Cafe in Antwerp. As in 3 previous countries Natalia has not appeared in the TV shows of state broadcasters, as they were prepared in advance, and there was no empty spot for the last minute tour of Podolskaya. The last stop of Natalia was Greece. Here interview for the weekly show Euromania was filmed and also interview for ERT website, and for another TV channel - Star Channel. But even here there was very low interest to the visit of Russian performer as public attention has already focused on Euroweek which was already launched in Kiev. On 12th of May traditional press-conference which usually sees Russian contestant off to Eurovision was held. It was made of same scenario year by year followed by National broadcaster Channel One. We have been insured in sure upcoming win of Grand-Prix by Russian performer. And it seems that the reason for this win is rotating yearly - in 2000, 2002 and 2004 it was Eurovision format of the song, but in 2001, 2003 and 2005 - this was nonformat of the song, the chance to be different from the other contestants. Producers have promised that Russian representative at Eurovision 2005 will have show some surprises in her performance. As Head of Musical Department of Channel One Yuri Aksiuta told "it is unthoughtful to reveal every secrets at the moment. Performance will be more striking if all our ideas will come as surprise for the viewers", undelined Aksiuta. In what field viewers could expect the surprises was not revealed either. On 13th of May Natalia has visited Finland, where she had already been for recording of the studio version and shooting of the video, for the last stop of her tour, and from there Natalia's team with Finnish musiciants went to Kiev. 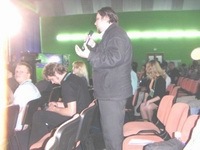 15th of May - Russian delegation is first noticed by fans at Slovenian Party in Euroclub. Mood of the delegation - very cheerful. Mood of others: a) hey, someone is not letting us to listen to accoustic performance of Slovene singer, b) ah, isn't it the Russian performer? c) seems so, let her sit over there in the corner and don't spoit Slovene party. May 16th - first rehearsal is run without stage costumes. Natalia is in red dress, which she weared on the party, and backing group is dressed in white T-shirts with "Russia" written on them. Delegation and singer herself are completely dissatisfied with the rehearsal and are making some changes. Song is performed three times - first - without cameras, and other two with cameras. After that in the viewing room crew is discussing the result. Natalia is not very glad "Why they film me from bottom? I'm not goodlooking this way. And they shouldn't also show shoulders!". Rehearsal is only viewed by stage workers and your correspondent - the reason is the same as the reason of delay of the first press-conference of the Russian participant - Official opening coctail party in Mariinsky palace. After the rehearsal Russian delegation also moves that way. At the night Russian delegation takes a rest at Belarus party. May 17 is opened by the delayed press-conference. In press-center circulates rumour that today's rehearsal will be cancelled, as Russians said they had enough of it, which appearse to be false news. Russian delegation even holds 2 press-conferences on the same day and don't cancel any of them as did some other participants. The delegaion members present at press conference are: head of delegation Yuri Aksiuta, unnamed other representative of the channel, possibly Igor Burenkov, enterpreneur of the Channel One, Natalia Podolksaya and her full supporting band and backing singers and co-lyricist of the song JP Chase. Conference is watched from the hall by other manager and boy friend of Natalia Igor Kaminskiy and representatives of Belarus delegation. Victor Drobysh, main manager of the singer is not present in Kiev. Both conferences were run on the same schedule, Natalia was doing the most talking job, speaking English rather well, but asking a lot of words from the enterpreneur, who did some mistakes as well. 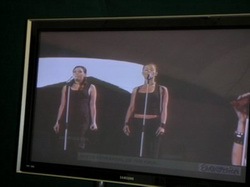 Acapella variant of the contest entry and Rechenka song were performed. At the second press-conference Natalia performed part of Alla Pugachova's song. It was discouraged to ask her to perform cover to the entry of Finnish National final recorded by her in Russian language as she might have forgotten the lyrics. The same "fishing stories" known to all fan in Russia, but rather new for international mass-media were told, about childhood of Natalia and her first connections with music, about magics of the figures, and standart question-answers on Belarus citizensip of the performer. "Eurovision is the first step in my career in Europe and abroad. After Eurovision I will continue working on my new album, we have already recorded a new song for it couple of days ago in Finland. Album will be in pop-rock style, not dance". "I'm absolutely not worried by what newspapers and other press writes about me. I do not have any time to read them and I absolutely don't care "
"My song is not anti-american. America is not anything but only the rhyme to the name Erica, and the situation described in the song can happen in any country of the world"
"I think this year rock song will win the contest, and it seems we made the right choice"
Other members of delegation were answering only my question. Yuri Aksiuta on my request has confirmed once again that they are completely satisfied with the result of the preselection and if they were making the choice and not televoters, they would have selected the very same song. Next year he was totally denying the thoughts he was expressing in Kiev. About the single of the participant Aksiuta has confirmed that it is already available to purchase and is one of the sales leaders in Russian Federation, which was not true either. Finnish musiciants couldn't give definite answer to the question how they have appeared involved in the team of Natalia and it was done for them by guitarist Valery Drobysh: "We were recording the song and video in Finland, and my father has lived in Helsinki for a long time, so there is nothing strange that we had invited professional Finnish musiciants to our band"
Public has not paid big attention to the press-conference of Russian participant. The reasons were too early start of the first press-conference and Scandinavian Party which has started at the same time with second Russian press-conference, and most journalists have prefered Scandinavia to Russia. After press-conference, Igor Kaminsky has thanked our website for the good job promoting Russian entry and helped us to organize interview with Finnish musiciants that we took exclusively for their fan site. Between two press-conferences another Russian rehearsal was held, it included 4 performances of the song, and again nothing was as it should be. As it appeared, yesterday remarks were not taken into consideration by TV crew and picture still was not good enough - specially main moments which should have been shown very close, but camera was taking them from some distance, and opposite passive moments were taken from close shot. This time Russian delegation has submitted second by second schedule of desired TV cameras work in written form and signed by representatives of organizers. Unfortunately Russian engineers, that were specially brought in the delegation, were not allowed to work with the sound. Second press-conference was run in contest costumes. On the morning of 18th of May, Natalia gives interview to Pavel Shilko, host of the contest, on his radio show at Gala Radio. Next Russian delegation moves on highly advertised excursion to the village museum Pirogovo. Journalists were not very willing to go to the excursion and it seemed for the moment that another attempt of Russian PR managers to make promotion to their entry will fail, thus all correspondents working at the press-center were specially invited to the trip. At the Pirogovo guests should had get impressed by houses covered with thatch, hand made doormats and windmills. Podolskaya got interested in wine press ("Were they drinking wine right here? "), birches in the village school ("Ah, this is how they look like!") and local dancers that started round dance with visitors. Russian party, despite the traditions, was not held at official Euroclub, but at popular night club "Patipa". Russian participant was supported by Ruslana, Kirkorov, Ovsienko, Varvara, Slava. Producer of Natalia Victor Drobysh finally arrives to Kiev. Everyone still believe that Podolskaya will win the contest and was shouting "Russia - forever", but in general Russian party was another Russian event not popular among the press, as most representatives of the media decided to stay at the official club for Macedonian party and not move to another part of the city for something unknown. On 19th of May Russian delegation had day off. Someone was sleeping after a lot of partying at the night, someone went for a shopping around the city, someone was meeitng with rare journalists and someone went to the semifinal to support Belarus singer Angelica Agurbash. May 20th, at the morning official celebration of Natalia's birthday was held, but then everybody had to start another day of hard work, as it was first day of final rehearsals, there were two runs during the day. Work of cameras has improved and though not all, but most remarks of Russian delegation were fixed. The only change in the dress of Podolskaya was size of the decollete, which was compared by many journalists with decollete of Israeli singer, which definitely helped her to reach the finals. So rehearsals were run pretty good, and mood in the delegation stays cheerful. Most Eurovision experts prognose 8-9th place for Natalia which would be good achievement. Final, 21st of May. Foru hours before the final broadcast best Ukrainian visage and hair stylists are working with the performers. Technicians wash the stage to get the biggest brightness. Podolskaya is not worried at all, she is joking with her team at the green-room, where performers are awaiting time to enter the stage, and drinks mineral water. Victor Drobysh starts to panic a bit "Why she is so calm! It is not joke!". Ruslana appears at the green room and wishes the best to all the participants. In the final Natalia gives very strong performance but she can not jump over her head. This is done by Greek singer who sings right before Natalia. After very average rehearsals Greek team makes brilliant show on stage with two special TV moments to remember, excellent lead and backing vocals. Which allowes to Greece, which was already guaranteed top three finisher to climb couple more places and to beat the obvious winner of the semifinal Romania. Russia is getting points only from the neighbouring ex-USSR countries, and also Finland, where TV commentators mentioned the fact of participation of Finnish musiciants at Natalia's band. Even though before the contest poll taken in that country put Russia on 39th place of 39 participants. In two hours after the show everyone, winners and loosers, together, celebrated the end of the contest. Russian delegation was not very disappointed - we again proved to be different from others, again didn't prove winning promises, and again blamed European politics, which somewhy favoured Malta, country, that has no neighbours, and Romania, which got the votest from such a "neighbouring" countries like Spain and Portugal, but... is not favouring us, the country with the biggest number of neighbours who keep feeding us with points, not depending on the song and the contestant. As the result of final Russian Channel One has maid the following announcements, not very different with the similar announcements made in previous years, which you can compare with the help of our site. Yuri Aksiuta, head of Russian delegation at the contest: Speaking about the result of Eurovision 2005, where Russian participant Natalia Podolskaya has finished 15th, it is not any catastrophy neither for Russia, neither for Natalia. It is just wrong turn of events. We should not worry about finishing 15th. Contest is contest, everytime someone should be first, someone last, and this is spirit of competition. Natalia has performed very well, and we can not blame her. Let's imagine for example that Dima Bilan has entered the contest instead of Natalia. Do you think his result with his song would be better? And I don't think so too." Interestingly, next year Mr.Aksyuta has presented very different opinion: "Last year we've tried experiment, when we introduced televoting. There are many ways to select Eurovision participant for "Eurovision". Internal selection is the most popular model. Experts, who knows well format of Eurovision, technology of hit songs creation, knows singing abilities and potential of each singer. Public selection is based first of all on emotions. Viewers usually select most popular singer. Natalia Podolskaya is the best example for this. Right after talents show "Stars factory" we've held Eurovision preselections and of course "factory" audience was watching and voting at Eurovision selection as well. This was the reason of Natasha's win, though clear expert favourite was Dima Bilan, which was mentioned by stand-by professional jury. If last year Bilan took part in Eurovision, I don't think we've had such a hot discussion. I don't know what place he would have gotten in Kiev, but I think we could hope for better result than we've achieved." If we will calculate that 24 countries were taking part, it is in the middle of the table. And it is rather interesting, Alla Pugachova has also finished 15th, and Philip Kirkorov only 17th, and Belarus singer he had produced also only 17th. Do you understand that? And I have impression from Eurovision that I was in the Ancient Rome, which was under the slogan "bread and entertainment". Also representatives of Russian delegation promised to change again the system of preselection to the Eurovision contest. Yuri Aksiuta: "I think that preselection of the Eurovision participant should not be run in the last 3-4 monthes before the contest, but we should start right now. I think it will be right... I think we will invent some way, when preparation to Eurovision will not be run during only last few month, but will be done throughout the year in some different shape. As then we will be able to use all possibilities to select right candidate". As we will see later - nothing had happened. We will not speak about politics, but such a low, 15th place of Natalia Podolskaya is first of all reward to the musical management of Channel One headed by Konstantin Ernst. Every Eurovision expert pointed out that it will be difficult for this song to enter even top 10. This was also shown by the results of different fan polls. But management of Channel One was not listening to anyone, pointing out that this song was selected by televiewers. And again, after the contest, all blames were send to unfortunate political conjucture in Europe for Russia. 1) The structure and state of the Russian show biz itself, which is not competetive abroad CIS borders, not depending how much money is spend inside Russia. One of the factors forming this business is Channel One itself, which has broadcasted only 3 live concerts during the previous year, at all the other concerts singers were miming with prerecorded tracks. Good example of it are the losses of Star Factory show participants at the international level. And country keeps sending them to the Eurovision contest while statistics show that winners of reality music show never acheived good results at the Eurovision. Golden words by Igor Talkov that "culture of the whole country still stays on the lowest level, and demand can be filled by conjunctural supply", are still alive in Russia. 2) Total lack of precontest promotion. You already know what was happening during the preparation days. Useless promo-tour, useless video, which was not broadcasted in any country but Russia itself. Even the minimus - promo singles were not send to the European radiostations and fans organizations and websites, which is a rule in other European states. It is clear that the blame should be shared between producers of the singer and management of Channel One. 3) Argues between the managers of the performer also did not add to the success of the entry. Igor Kamiskiy thought that Natalia performed in Kiev on the average level, as many others did, because Victor Drobysh has not allowed her to use all the depth of her vocal. 4) The only thing we have to agree is that there are no reasons to blame Natalia herself, who performed on the top of her abilities, but could do nothing to turn outdated average Americanized pop rock song into the hit. Some sources have already started rumouring that next year Natalia will return to the contest representing Belarus, as a possible reply to Angelica Agurbash's announcement that she will represent Russia at Eurovision 2007. 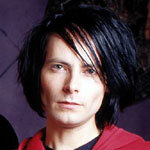 Was born in Mogilev, Belarus on May 20, 1982. Since 9 years old was studying at "Studio-W" of Mogilev liceum of music and choreography. As member of this group she became laureat of contests "Zornaya rostan", "Magutniy bozha" (Belarus), "Goldenfest" (Poland). Finished music school piano department. As solo singer tooks part at different music contests - "Zolotoy Shlyager 99" (First prize), "Slavyanski Bazar - Vitebsk 02" (Third prize), "Universetalent Prague 02" (Grand-Prix). In 2004 takes part with Michael Jay's song Unstoppable at National Belarus Preselection to the Eurovision Song Contest and finishes second. Natalia graduates from Belarus insititute of Law in Mogilev and moves to Moscow where she enters vocal department of Moscow Institute of Contemporary Art. Her Russian producers are Iosif Prigozhin and Victor Drobysh. Natalia takes part in reality show of Channel One "Fabrica Zvezd" and in the end of December 2004 issues debut album "Pozdno" (Too late). Mary S. Applegate has over 400 releases and has worked with some of the best writing and producing teams in the world. She received the ASCAP award for her part in ‘The Power of Love’ (Celine Dion) and has written for Milli Vanilli, No Mercy, Aaron Carter, Modern Talking, Kaylou, Gotthard, Air Liquide, La Bouche and others. J.P.Chase, aka J-P Jarvinen, is a 36-year-old songwriter from Finland. He was in the Finnish Eurovision final in 2002 with the song ‘Make The Rain’ and in the semi-final in 2004 with ‘Reason’. He was writer-producer of the album ‘Jazmine – Nightfall’ in 1997. He was Finnish ice-hockey champion in1988 and has two children – Kiia who is 12 and Samuli who is 8. Victor Drobysh was born in Saint Petersburg, Russia. He studied piano and graduated from the Rimsky-Korsakov Music College. Since 1996 he has lived in Germany and has worked with BJ Ze Prince of Red and produced songs with Peter Ries for ‘No Angels’. He has received several gold discs. In 2002 at the World Music Awards in Monte Carlo Russian singer Kristina Orbakaite performed Victor’s song ‘All My Love’. He won the ‘Song of The Year’ Festival ‘Pesnia Goda’ in 2002, 2003 and 2004 and was awarded the Order for Revival of Russia. In 2004 he worked in Russia as a producer of ‘Star Factory 4’ and has recently set up his own studio. There are two versions of the single - Russian and International, which are different only in the package and language of titles. Also Channel One has issued few demo versions of CD and DVD which were spread during the meeting of the heads of delegations. All available versions of the albums with Russian National Preselection 2005 are pirated and contain studio records mixed with some live performances. Some of the entries were never recorded in studio. video clip - main variant 20Mb - contains 1 video in the finla, two video variants in one file - 40Mb, 17Mb, 11Mb. Used: own materials, interviews and views from Kiev, information of podolskaya.info and news agencied (ITAR-Tass, Dni.ru, Rodnaya Gazeta, Izvestia, MK). Photos: ESCKaz correspondents, press-service of the contest, doteurovision.com/ and other sources.